Chalk Walk 2010 Sponsors Recognized! 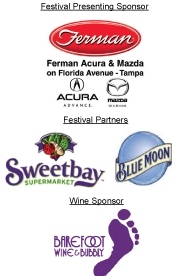 Greetings everyone, Jessica here with a Tampa Bay area events update from our favorite Chalk Walk art festival hosts, the Tampa Bay Businesses for Culture and the Arts (TBBCA). That&apos;s right, the second annual Chalk Walk is right around the corner! This event brings the community together around art and this Mother&apos;s Day weekend the sidewalks of Hyde Park Village will be covered with art. Over 45 artists will be celebrating the arts and competing for $2,600 in prizes! Of course, this event wouldn&apos;t be possible without the support of the community and the local artists who display their talents every year. Numerous sponsors have also donated to TBBCA&apos;s spectacular event this year and the organization would like to thank them!!! From art aficionado to playful pedestrians, this festival has something for everyone to enjoy! Come on out and see for yourself May 7 through May 9 in Hyde Park Village! !